On Monday, Stop Funding Climate Change UChicago (SFCC), a student-run divestment campaign, released an open letter signed by more than 250 faculty members urging the Board of Trustees to divest from fossil fuels. The petition and the SFCC mission received national attention through an exclusive feature in The Guardian’s US Edition, also released on Monday. The release of the open letter was accompanied by an installation on the main quad. 256 orange squares were placed in the grass to visually represent the faculty members who signed the petition. The orange squares were accompanied by signs that showed definitions and statistics about the petition. 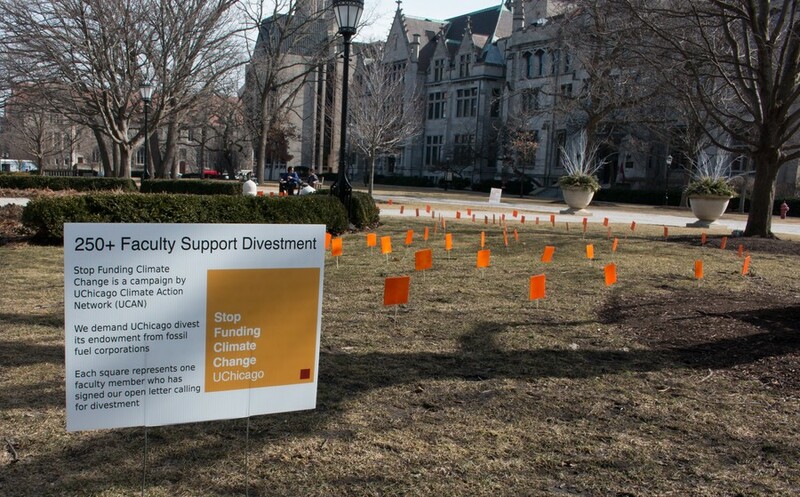 Of the faculty supporting divestment, 37.7 percent came from the biological sciences division, 29.2% came from the humanities, 27.3 percent came from the social sciences, and 5.8 percent came from the physical sciences. According to SFCC, by choosing to divest, organizations can stigmatize the fossil fuel industry. By producing a public display, organizers hoped to send a message that support was widespread. “The orange square has become the symbol of divestment, so we thought it would be powerful to put one in the quad for each faculty member who signed our letter,” first-year and SFCC media team member Isabel Bloom wrote in a statement. Last year, President Zimmer noted that it was “unlikely” that the University would divest. “The administration has a moral obligation and an ethical obligation to take action. We’re trying to demonstrate the fact that there’s overwhelming support for this,” Annabelle Rosser, external communications coordinator for UCAN, said.